I'm not the most competitive, aggressive go-getter type of person. I'm very much a Type B, go-with-the- flow personality,which is great in a lot of ways, but can be detrimental in others. When it comes to goal-setting and achieving things I want to do, I never really was someone to reach for the stars and go after what I wanted. In college, the majority of my friends were type A women who were driven, ambitious, and some of the hardest working women I know. Now that I have a full-time job in marketing, I am surrounded by a team of women who are also passionate, inspirational, and remind me a lot of the Energizer bunny - they always seem to be going. I always admired my friends and my coworkers immensely for the type of drives that they had, and I always assumed that I just lacked whatever quality it was God gave them. However, my amazing roommate had a talk with me one night when I made a comment that I didn't think I could do something. She said, "Why not you?" This weekend I achieved one of my goals that I didn't think I was smart enough to do, which was pass the NASM personal trainer certification test. The endorphin high I got from achieving this long dream goal was indescribable, and it got me thinking of what I want to do next. And then I thought, “Why not me? Why not do it for me?” Then I did. And it feels great. I gained weight and got depressed. I thought I lost control of my health, and I didn't think I could gain it back. But why not me? Why did I think I couldn't gain control and lose it. So I have taken steps this week to gain back control. I've already lost a few pounds. And God goes "Why not you?" How powerful! There is nothing I can't do when the spirit of God is with me. As I take this journey to being healthier physically, I'm learning how to be spiritually healthy as well. So, the next time you doubt yourself, take it to God and then ask "Why not me?" 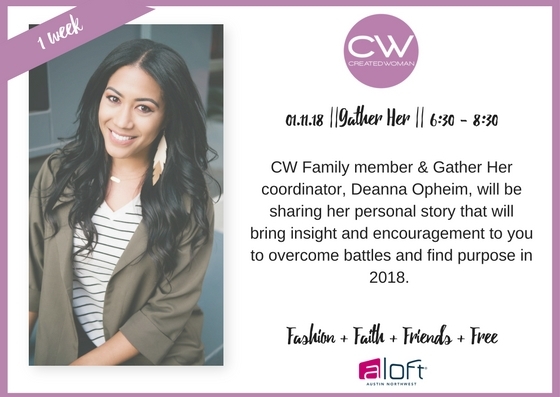 CW Family member & Gather Her coordinator, CW Deanna Opheim, will be sharing her personal story of overcoming shame that separated her from God and purpose. After a myriad of battles, she finally came to a place of redemption and restoration that brought freedom to her true identity. Now, Deanna is walking out her purpose and wants to encourage you in your season of life! Whether you are in a dry and broken place or a season of joy and gladness, her testimony will bring insight and encourage you to overcome battles and find purpose in 2018.